The word "timeless" typically refers to objects that have a lasting presence and/or aesthetic effect. However, this term does not describe the various home decor styles that soaked in the limelight and then quickly vanished during the '70s, '80s, '90s, and '00s. In spite of these hasty home happenings, appearances of such decade specific patterns, styles, and designs are making their way back into the abodes of homeowners everywhere. But this time...they may be here to stay. The '70s can be identified as an era full of peace, love, and...neon carpets?! 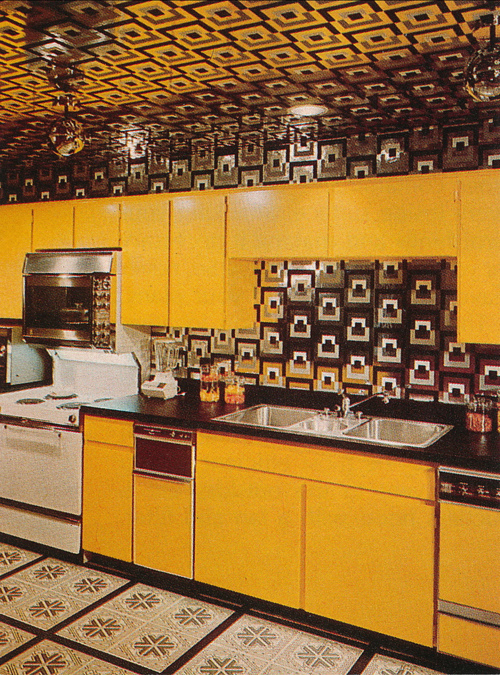 Although the neon carpet probably isn't a modern update for hip homeowners, unlike previous decades, the '70s classic kitchen had an abundance of space and storage to contain the technologies and appliances that were becoming standard amenities. Additionally, built-in desks, beds, and other furniture were introduced during this distinctive decade. Notice the extensive built-in bookshelf along the back wall. Large kitchens, expansive storage units and built-ins are not unfamiliar territory in the modern household (thanks to the '70s). Although these added spaces are becoming standard among homeowners, the variety and designs are endless. Although spacious kitchens began in the '70s, bright white and tons of storage make this modern day kitchen a timeless piece. Additionally, paneling used on the walls of family rooms and recreational rooms were a result of the '70s. While most homes are panel-free (from the traditional brown vertical panels), there are still traces of paneling...but with a modern flare. Although we may not return to neon carpets and retro color palettes, we must be thankful for what the '70s have attributed to modern day homes. Where would we be without our spacious kitchens, beautiful built-ins, and The Bee Gees?